A new error card has been spotted by the keen eye of collector Linda Ringland. Yes, this interesting discovery was first reported by my good friend, Mark Knowler, at www.TeaCards.Com but I can report on it too, right? It's better to read about it in two places as opposed to no place at all, that's what I say. The discovery was made in June of 2005. The left card shows the NWF writing on a portrait orientation. The right card shows the NWF on a landscape orientation. What about a comparison? Here are the 3 known variations in the number 31 card, Canadian Portrait; Canadian Landscape; and US Landscape. The first card show here is the less common card. One could argue that it is correct and the more common Canadian and the US cards are in error. What is the correct orientation? I firmly believe that portrait is what was designed. 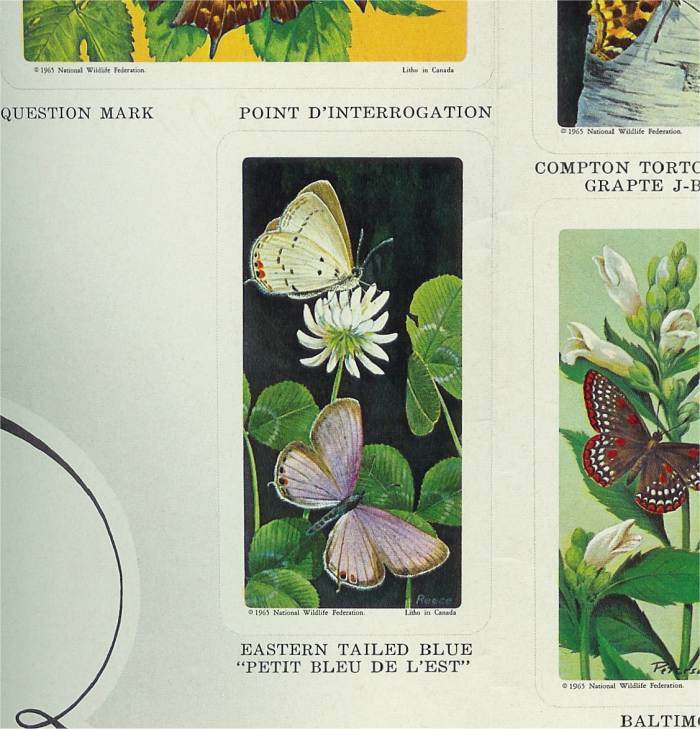 The album shows a portrait orientation for pasting and even more telling, the wall chart for Butterflies shows it in portrait. Closer examination even shows the portrait writing. The wall chart clearly shows the portrait orientation and portrait writing. Which is the "error" card? Another good question. I believe the correct card was made first, the Canadian Portrait card. It would have been used to layout the album and for a photo shoot for the wall chart. I then believe a printer decided that Portrait was a mistake and error cards were printed thereafter. The albums and wall charts were more than likely printed on different machines than the cards and subsequent trips to the printer were probably for more cards. The printer was probably not aware of the album and wall chart indicators. The previous paragraph is total speculation, but fun nevertheless. 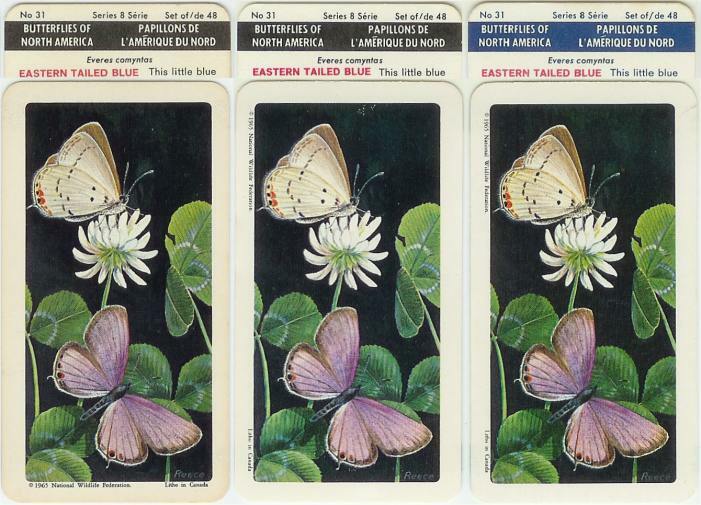 One thing is for sure, there are two separate printings of the Canadian Butterflies series. What's in your collection? All 6 US cards I could check were landscape. Of the 8 Canadian cards, 2 were portrait and 6 were landscape. Paul from Toronto reports that of the 4 Canadian cards he has, 1 is portrait and 3 are landscape. That's a steady 25% for the two of us. What about the rest of you?